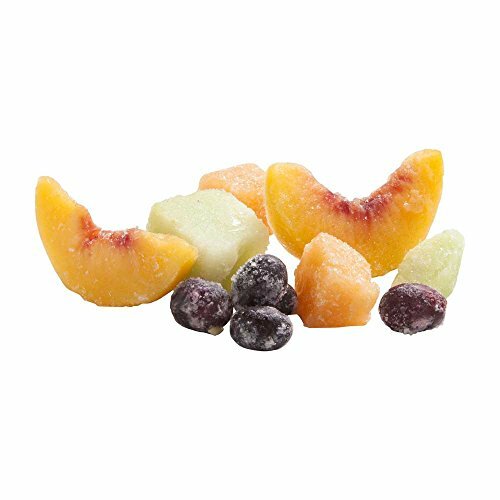 Simplot Classic 4 Part Mixed Fruit, 5 Pound -- 4 per case. Product Benefits Hand-scooped melon balls for uniform appearance. Product is ready to use - no washing or peeling. Vitamin C (ascorbic acid) is added to help prevent oxidation, providing excellent hold times. IQF pack for easy convenient portioning. No sugar added for more versatility in serving options. Specifications 50% Sliced Gem Peaches. 20% Cantaloupe Balls. 15% Honeydew Balls. 15% Dark Seedless Grapes.